Is there such a thing as a former Longhorn? 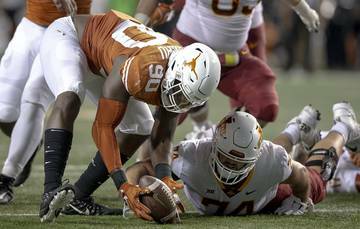 These players will always be Longhorns to University of Texas fans, even though they’ve graduated to the next level of football. Every week we’ll update you on how they performed the previous weekend. Here’s a look at the Longhorns in the NFL and how they fared in Week 10. Week 10 was a big week for upsets. 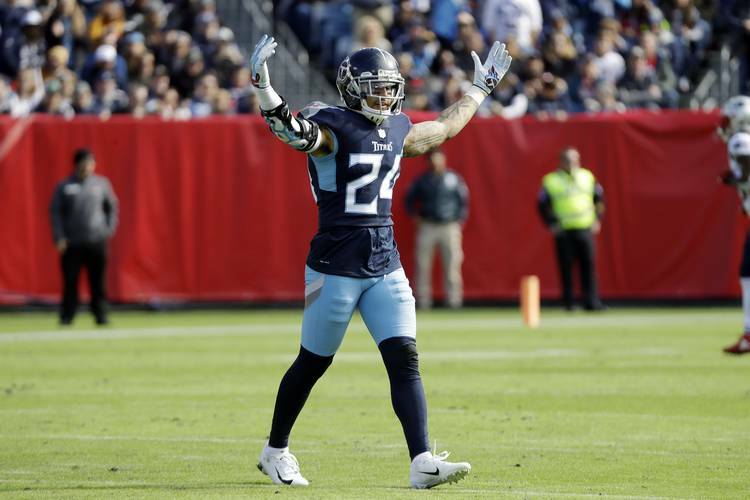 A pair of former Longhorns, Kenny Vaccaro and Brian Orakpo, played their part in the biggest one of the day as the Titans surprised the New England Patriots, 34-10. Vaccaro had five tackles and this great hit for a tackle for loss. Marquise Goodwin made four catches for 69 yards in a 27-23 loss to the Giants on Monday night, but he made a highlight in the pregame warmup. Goodwin and counterpart Odell Beckham Jr. had a playful moment with Goodwin’s sister, Deja, who is confined to a wheelchair due to cerebral palsy, on the sideline. The two had a mini dance-off and later signed and swapped jerseys after the game. Michael Dickson keeps proving why he was a fifth round pick of the Seattle Seahawks. He had a strong game in the 36-31 loss to the Rams. Dickson did his part, averaging 55 yards per punt and landing one inside the 20. It was actually inside the 5-yard line. Dickson is now tied for the league lead in punt net average at 43.8 yards per punt. Here’s former NFL punter Pat McAfee losing his mind over Dickson’s perfect punt late in the first half. The Los Angeles Chargers are in the midst of a six-game winning streak after beating the Raiders 20-6 Sunday. Adrian Phillips had a productive day, making nine tackles and defending a pass. He was in on a play that set the tone for the game, stopping the Raiders on a fourth-and-goal situation. Phillips wasn’t the first guy in on the play, but he made sure the Raiders came way empty on the possession. Jordan Hicks, LB, Eagles—7 tackles in the 27-20 loss to the Cowboys. Malcom Brown, DT, Patriots—6 tackles in the 34-10 loss to the Titans. Alex Okafor, DE, Saints—3 tackles, 0.5 sack, 0.5 tackles for loss in the 51-14 win over the Bengals. Brian Orakpo, LB, Titans—3 tackles, 1 tackle for loss in the 34-10 win over the Patriots. Quandre Diggs, CB, Lions—3 tackles, 1 pass breakup in the 34-22 loss to the Bears. Malcolm Brown, RB, Rams—1 catch for 10 yards in the 36-31 win over the Seahawks. Geoff Swaim, TE, Cowboys—3 catches for 13 yards in the 27-20 win over the Eagles. Trey Hopkins, OG, Bengals—The entire team had a dreadful time in the 51-14 loss to the Saints. Malik Jefferson, LB, Bengals—3 tackles in the 51-14 loss to the Saints. Phil Dawson, K, Cardinals—2 for 2 on extra points in the 26-14 loss to the Chiefs. Colt McCoy, QB, Redskins—Backed up Alex Smith in the 16-3 win over the Buccaneers. Poona Ford, DT, Seahawks—Didn’t log a stat in the 36-31 loss to the Rams. Holton Hill, CB, Vikings—Hill and the Vikings were on bye in Week 10. Justin Tucker, K, Ravens—Tucker and the Ravens were on bye in Week 10. Connor Williams, G, Cowboys—He had arthroscopic surgery on his right knee last week. The Cowboys beat the Eagles 27-20 without him, but he could return as soon as Week 11. Hassan Ridgeway, DT, Colts—Was inactive for Week 10. D’Onta Foreman, RB, Texans— Officially taken off PUP list Tuesday. Week 7 was the first week Foreman was eligible to be added to the active roster. His Texans were on bye in Week 10. He still hasn’t started officially practicing yet, but it’s looking like that could start this week. Week 1, Week 2, Week 3, Week 4, Week 5, Week 6, Week 7, Week 8, Week 9.